Story by: Story by SPC Richard Mayfield, - New York Guard. 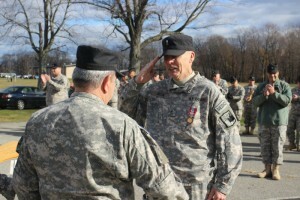 CAMP SMITH TRAINING SITE, CORTLAND MANOR, NEW YORK �“ On 03 December 2016, Somers resident, Paul Green, a WO1 (Warrant Officer 1) in the New York Guard, was awarded the New York State Medal for Meritorious Service Award from the New York State Division of Military and Naval Affairs for his heroic actions responding to a dangerous and potentially life threatening auto accident in the Town of Somers. On 11 June 2014, Green, who is also a volunteer member of the Somers Fire Department, responded to a motor vehicle accident with multiple personal injuries reported. Upon arriving at the scene, Green assessed the situation and immediately began rendering assistance to the passengers. At the time of the incident smoke was emanating from multiple points of the car and passengers had sustained serious injuries. Green was able to stabilize the first passenger and remove him from the car preventing further injury. WO1 Green credited his training as a nurse, emergency medical technician, firefighter and New York Guard member for having the skills necessary to assist those in harm’s way. Green went on to say, “You need to train as if someone’s life depends on it because it will”. Green who has been a member of the New York Guard for the past five years is currently a Warrant Officer and Licensed Practical Nurse assigned to the New York Guard’s 244th Medical Clinic. As a vital member of the 244th Medical Clinic and the New York Guard, WO1 Green renders invaluable service not only to his fellow soldiers but to the people of the State of New York. Green currently lives in Somers with his wife of 21 years Leslie and their daughter.